There is a popular shawarma shop in central Amman that attracts customers from all walks of life. It makes an excellent place to sample public opinion. 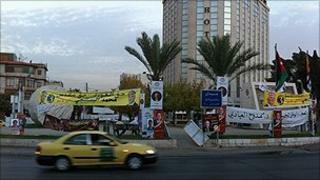 As a Jordanian taxi-driver munches on his meat sandwich he stares at the parliamentary election campaign posters competing for space on a nearby round-about. He laughs when asked about his plans for the 9 November poll. "Even if my brother was up for election, I wouldn't vote," he declares. "What's the point?" A man dressed in a suit and tie explains what he sees as the reasons for such apathy. "Most of the candidates you see are from certain big, rich families. We've seen all these names many times before," he says. "Nobody is sorting out the problems of unemployment or water shortages or Palestine." In Jordan, the strongest opposition force, the Islamic Action Front (IAF) - the political party of the Muslim Brotherhood - is boycotting the election in protest at the electoral system. It says this is biased in favour of loyalists to the ruling Hashemites, Jordan's royal family, and worries about a repeat of the corruption and vote-rigging reported in 2007. "The government should really let the people participate and choose freely on their own," comments IAF member, Saoud Abu Mahfouz. "The nation deserves the chance to decide its own future but unfortunately it decides to play games." The election follows a year of direct royal rule, after King Abdullah dissolved the previous parliament - which was widely accused of being ineffective - half-way through its four-year term. A fresh poll was delayed to allow a new election law to be drafted but critics say that this ignored demands for reform. Districting rules continue to give greater representation to less-populated rural constituencies - where people tend to vote on tribal lines - than to densely-inhabited urban ones. This is where Jordanians of Palestinian origin mostly reside, who are more likely to support Islamist candidates. Whatever the shortcomings, across the capital, a huge effort is being made to give the impression of a vibrant democratic process. Image caption An IAF placard reads: "We are boycotting the election because we love Jordan"
Campaign tents have been set up on the streets, colourful banners strung across bridges and there is a television channel dedicated to the campaign. Prime Minister Samir Rifai insists the government is "committed to holding transparent elections" while the information minister, Ali Ayed, maintains that "Jordan guarantees the freedom of expression of its citizens". Yet researcher, Shadi Hamid of the Doha Brookings Center, questions what he sees. "There is no doubt this really is a massive elaborate charade. I can't think of another election where there's such a discrepancy between the appearance and the substance," he comments. "There are all these posters, there seems to be a lot of political activity but there is really no opposition running and I just have trouble believing people are going to vote and take it seriously." In the past, Jordan has been celebrated as a model for progressive reform in the Middle East - particularly because of its success incorporating Islamists in government. However commentators suggest there has been a reversal in Jordan which few of its Western allies want to draw attention to. "There is a serious credibility issue for the United States and some European countries which endorsed the rigged elections in 2007," says Jordanian analyst, Fares Braizat. "It shows the discrepancy with the public discourse that these governments present when talking about the need to have more open, participatory and transparent political processes across the region." Washington and Brussels are trying to keep direct peace talks going between Israel and the Palestinians, contain Iran's nuclear programme and deal with a threat from Al-Qaeda in the region. They view moderate Arab countries, like Jordan, as playing a key role. "What matters to the US and the Europeans are their own interests," Mr Braizat observes. "As long as these are served by the Jordanian government and others in the region: never mind democracy and human rights!" Back at the shawarma store most of those queuing up to buy their snacks are equally cynical. One woman jokes: "If you come on election day this is where you will find the long line, not outside the polling station."